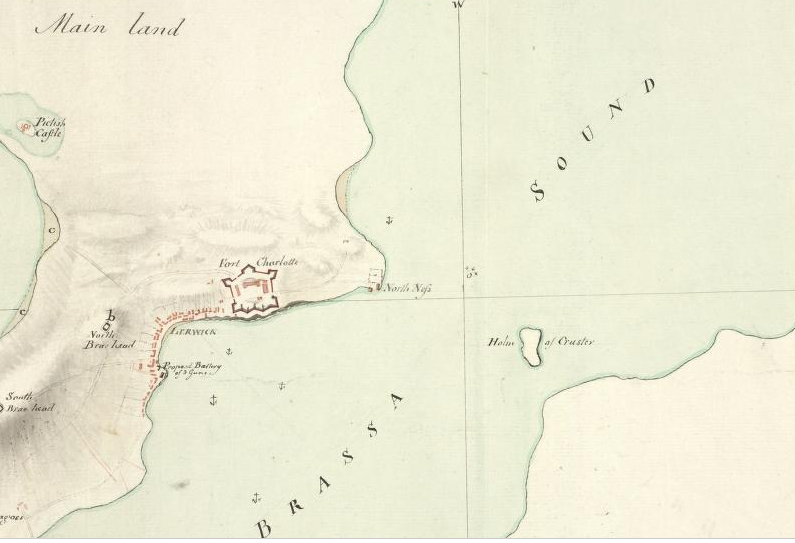 1811, Resolution, Shetland, William Scoresby Jr.
Brassa Sound separates the island of Brassa (now known as Bressay) from the mainland of Shetland, where Greenland whale ships often called to pick up crewmembers, water, and other supplies on their way north. On Saturday March 16, 1811, at around 2pm, Scoresby brought the Resolution to anchor ‘about the midddle ground,’ not far from Shetland’s main settlement, Lerwick. Also in the sound were four other Whitby ships, as well as the Egginton and Harmony of Hull, and the Fountain of Lynn. The following day, Sunday, the crew attended church on shore, and over the course of the following week, the ship was inspected, and seawater taken on board as ballast. Scoresby had problems with insufficient draft in Whitby harbour, so the ship was not carrying enough when it sailed on March 11th. The wind being favourable at about 6AM “knocked out” all hands and as quickly as possible weighed the anchor hanging the Ship in the mean time by the Henrietta with a warp sailed safely out of the Harbour and hove too at the mouth gave the Pilots some Beef Pease and Oatmeal a little Brandy also their fee for Pilotage and attendance then dismissed them made sail. At noon moss head bore about SWbW distance 15 miles. Map from the National Library of Scotland military maps collection. « Into the Ice: March 25-31st, 1811.